On September 22 at UTC 8:00 AS51136, belonging to the HomeCredit Bank, leaked more than 55 000 prefixes between two huge ISPs Transtelecom (AS20485) and Vimpelcom (AS3216). Most of the affected prefixes are originated by ISPs from United States, China, Brazil, Japan, Mexico, Canada and Russia. This anomaly ended only at 10:22, making this route leak enduring for more than 2 hours. This route leak was the result of both misconfiguration at HomeCredit Bank network and absence of correct ingress BGP filters at Vimpelcom. 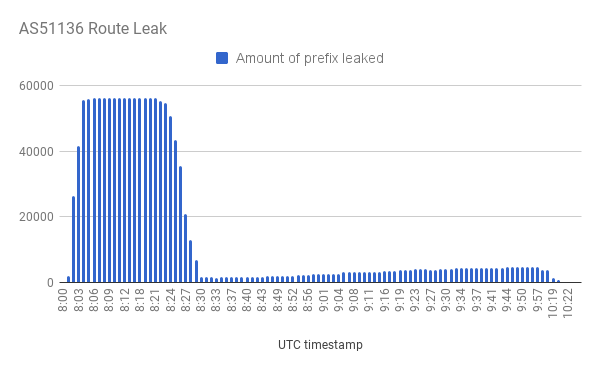 Such amount of leaked prefixes guarantees not only availability problems for HomeCredit Bank, but also results in availability issues for all ISPs that accepted routes from these anomaly. Foremost, this anomaly influenced Vimpelcom users, but also affecting other ISPs all over the world.